WASHINGTON, D.C., September 27, 2018 — Iron oxide nanoparticles are used in sentinel node detection, iron replacement therapy and other biomedical applications. New work looks to understand how these materials age, and how aging may change their functional or safety profiles. For the first time, by combining lab-based Mössbauer spectroscopy with "center of gravity" analysis, researchers can quantify the diffusive oxidation of magnetite into maghemite, and track the process. In Applied Physics Letters, by AIP Publishing, the work is poised to help understand the aging mechanisms in nanomaterials, and how these effects change the way they interact with the human body. "It's almost an unasked question about how this material oxidizes over time," said Dr. Quentin Pankhurst. "We need more information about it. This technique helps us know what's happening as products are sitting on the shelf." 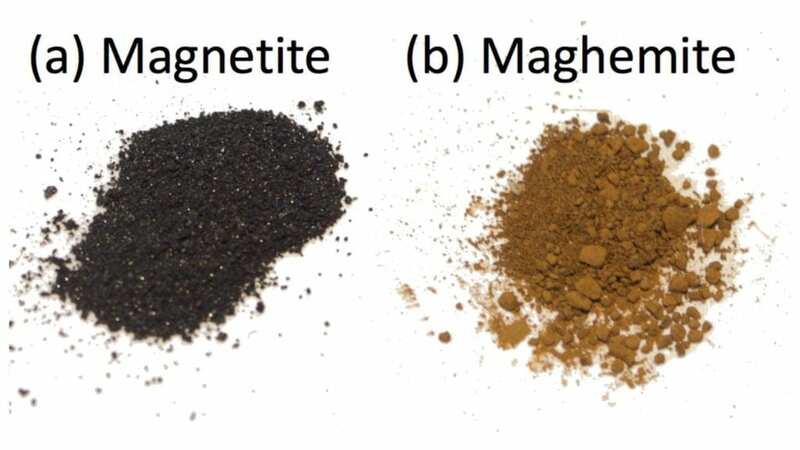 Distinguishing the two forms of iron oxide nanoparticles is so difficult that it has led to an unofficial convention of naming samples "magnetite/maghemite" when their composition isn't known. Mössbauer spectroscopy uses nuclear gamma rays to measure how much of a sample has iron atoms with the +2 charge found in magnetite compared to the +3 charge that predominates in maghemite. These subtle measurements are processed with center of gravity calculations, which combines the data to create a bigger picture for the sample. Moreover, the test doesn't destroy samples, so researchers can track the oxidation of iron oxide nanoparticle over long periods of time. Next, the group is looking to extend its technique to a broader range of magnetite and maghemite samples and help other researchers better understand how a nanomaterial's age correlates with its functional properties. "We've raised a question about whether the oxidative aging affects the particles, but we haven't seen if that's the case or not," he said. "Now there's this idea that aging is going on, and that's a whole other parameter we haven't been measuring. I'd be delighted if other people explored this correlation between function and aging in their own materials." The article, "Environmental oxidative aging of iron oxide nanoparticles," is authored by Lara Bogart, Cristina Blanco Andujar and Quentin A. Pankhurst. The article appeared in Applied Physics Letters Sept. 25, 2018 (DOI: 10.1063/1.5050217) and can be accessed at http://aip.scitation.org/doi/full/10.1063/1.5050217.